People in Banten have probably heard about Krakatau Country Club. This recreational place is situated in Cilegon City. To be exact, it lies in Marzuki Street 39. Also, it belongs to Kebondalem Village and Purwakarta District. 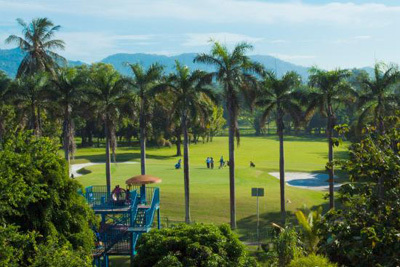 This place provides different types of fun facilities to the guests such as a golf field, pools, sauna, a tennis court, restaurants, karaoke lounges, and much more. In a nutshell, KCC is the most completed recreational spot in Banten. You can either come with your families or friends. The first impression you get when visiting KCC is an amusement. It is because this place offers complete fun facilities for everyone regardless of the age. Mostly, the visitors are families with kids. It is because the facilities are suitable for children. The pools are the most favorite section, actually. There are also some rubber boats and other facilities. In terms of nuance, this tourist spot is surrounded by trees. That means visitors can feel a comfortable atmosphere when spending good times and playing with their families. According to the locals, the management only provided swimming pools for visitors. In some occasions, Krakatau Country Club also becomes a location for a swimming competition. People in Cilegon are always waiting for such event. Today, tourists can enjoy numerous fun facilities. The best feature is indeed the “water boom”. It opened in 2009. Many families take advantage of it as a perfect recreational spot and relaxation. It features 4 different swimming pools. One of them has the depth of 1 m. This pool also includes a slide with a strong current. The height of the slide is about 20 meters. In terms of shape, it is similar to a snake. There are different spirals with a distinct color, too. Next, there is a pool for kids. The depth is only 60 cm. It features a slide in the midst part of the pool. Actually, the best feature is a giant bucket. It may spill the water every 1 minute and 40 seconds. Overall, it is safe and suitable for your kids. For adults, the previous pool is a better choice. Krakatau Country Club has many facilities. However, the water boom is definitely a great option for a family with kids. Thanks to the management. It has become a merrier tourist spot these days. The environment is clean and the facilities are splendid. There is even a flying fox crossing the water boom. Not to mention the guests are able to rent an ATV and get around the location. With all these features, KCC is everyone’s favorite tourist destination. Make sure to visit it with your families. If you want to visit KCC, you must head to Banten Province first. From Jakarta, it takes 2-3 hours and the distance is approximately 110 km. If you come by private vehicle, you can simply take Pantura Street. Once you reach Cilegon, you must head to Purwakarta District and Kebondalem Village.